Democrat (Term Expires: 2020) serving Montgomery (part) and Philadelphia (part) Counties. Senator Vincent J. Hughes represents the 7th Senatorial District in Pennsylvania and serves as the Democratic Chairman of the Senate Appropriations Committee, a position he has held since 2011. He has served in the Senate since November, 1994. He served as a Pennsylvania State Representative from 1987-1994. From 1991-1994, he chaired the Pennsylvania Legislative Black Caucus. Senator Hughes has a career long commitment to providing health insurance for the uninsured and his leadership, public advocacy, and legislative strategy led to Pennsylvania’s full implementation of the Affordable Care Act. Senator Hughes was a leader in the fight to raise the state minimum wage. Former Pennsylvania Governor Ed Rendell called Senator Hughes "our general" in the successful legislative battle to increase wages for low-income workers in Pennsylvania over $1 billion. Senator Hughes has received national attention for his introduction of Senate Bill 806, The Universal Automatic Voter Registration Act, which would automatically register people to vote whenever they have any interaction with state government. 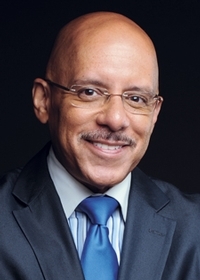 Senator Hughes has been recognized locally and nationally for his work on HIV/AIDS, and the challenges of behavioral health in the African-American community. A believer in breaking down the financial barriers for underserved students in higher education, he has raised over $1 million in scholarship funds for students to attend college. He is a leader in the fight for paid sick leave, and a leader in creating housing for veterans and survivors of domestic violence. Senator Hughes, a champion for neighborhood economic development, is currently introducing a comprehensive "Marshall Plan" for housing and urban revitalization. Senator Vincent Hughes is a trustee of the Mt. Carmel Baptist Church, and is supported by his loving wife, actress, entertainer and activist Sheryl Lee Ralph, and their blended family of four children.